Import trades, calculate gains, and prepare your tax report in 10 minutes! Spend minutes doing your crypto taxes. Not hours. CryptoTrader.Tax makes it easy to calculate your bitcoin and crypto tax liability. Just follow these steps! First, import your trades using our automatic import tool or upload them by CSV. Next, add your incoming and outgoing crypto transactions over the course of the year. Finally, select a tax season and download your report! Or import your trades from any crypto exchange using the Manual Exchange template. Don't overpay on your taxes. CryptoTrader.Tax calculates your crypto tax liability using the same FIFO method that CPAs use. You can rest assured that you are paying the correct amount and minimizing your tax liability. Export your tax documents for easy filing. 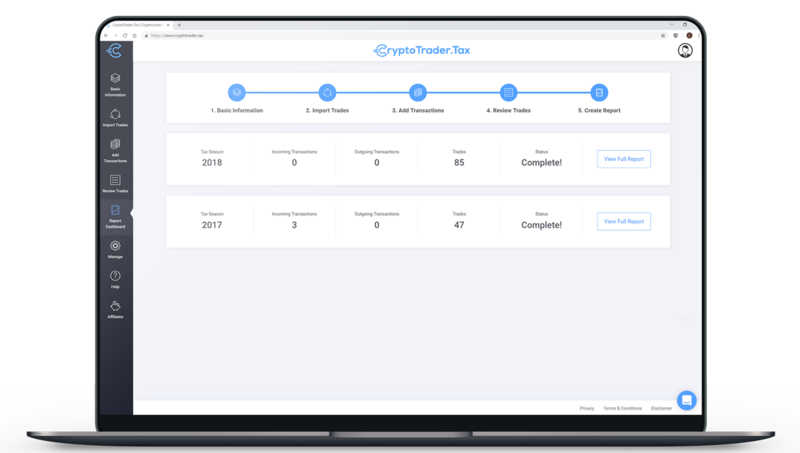 CryptoTrader.Tax directly integrates with the largest tax preparation platform to make it easy for you to E-File your crypto gains and losses with your full tax return. Your reports can be directly imported into TurboTax Online and TurboTax Desktop!